Why is Carbon Monoxide so Poisonous? Carbon monoxide (chemical formula CO) is a colorless, odorless, flammable and highly toxic gas. It is a major product of the incomplete combustion of carbon and carbon-containing compounds. Oxygen is a nonmetallic element constituting 21 percent of the atmosphere by volume. Oxygen is also found in many compounds such as water and iron ore. It combines with most elements, is essential for plant and animal respiration, and is required for nearly all combustion. Carbon monoxide binds very strongly to the iron atoms in hemoglobin, the principal oxygen-carrying compound in blood. The affinity between CO and hemoglobin is 200 times stronger than the affinity between hemoglobin and oxygen. When CO binds to the hemoglobin it cannot be released nearly as readily as oxygen would be. The preferential binding of carbon monoxide to heme iron is the main reason for carbon monoxide poisoning. Each of the 4 sub-units contains a heme group. Each heme has an iron atom in the center which can bind an oxygen molecule. 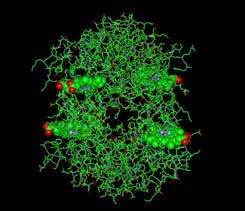 The heme fits into a hydrophobic crevice in the proteins partially exposed to solvent. Shown here is one of the four subunits of the hemoglobin molecule. A molecule of oxygen (O2) is shown bound to Fe. The Fe2+ ion is coordinated to 4 N's on the pyrrole ring, The 5th ligand is a proximal His (the 8th amino acid on helix F). Oxgen is shown bound to the 6th coordination site pulling the Fe into the plane of the ring. Carbon monoxide also binds coordinately to heme iron atoms in a manner similar to that of oxygen, but the binding of carbon monoxide to heme is much stronger than that of oxygen. The preferential binding of carbon monoxide to heme iron is the main reason for carbon monoxide poisoning. CO binds to the same heme Fe atoms that O2 binds to. CO displaces oxygen from hemoglobin because it has a 200X greater affinity for hemoglobin.